NASA's Dawn spacecraft was sent to investigate the asteroid Vesta in the asteroid belt situated between the Earth and Mars. Now, Dawn's instruments are revealing the true complexity of this object discovered over 200 years ago. It is so complex that Chris Russell, Dawn principal investigator from UCLA, and his team are calling the asteroid Vesta the smallest terrestrial planet. Russel says, "We're seeing enormous mountains, valleys, hills, cliffs, troughs, ridges, craters of all sizes, and plains. Vesta is not a simple ball of rock. This is a world with a rich geochemical history. It has quite a story to tell!" NASA video: Is Vesta the Smallest Terrestrial Planet? The reason for the pronouncement is because Russel notes that Vesta has an iron core and that the surface features indicate that the it is "differentiated" like the terrestrial planets Earth, Mercury, Mars, and Venus. Differentiation is the process when the interior of an active planet gets hot enough to melt. As it melts, it separates its materials into layers. The light material floats to the top while the heavy elements, such as iron and nickel, sink to the center of the planet. They believe that this also happened to Vesta. But why is it small? Researchers theorized that around 4.57 billion years ago, when the planets of the Solar System were starting to form, Jupiter gathered itself together. Its powerful gravity stirred up the material in the asteroid belt so objects there could no longer coalesce. Vesta was in the process of growing into a full-fledged planet when Jupiter interrupted the process. As the core of Vesta melted, lighter materials rose to the surface, forming volcanoes and mountains and lava flows. 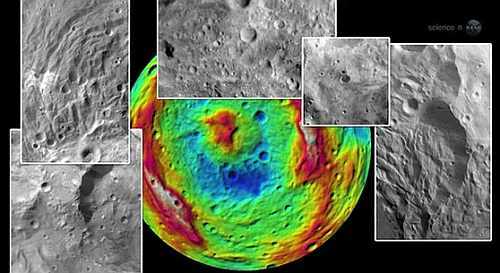 "We think Vesta had volcanoes and flowing lava at one time, although we've not yet found any ancient volcanoes there," says Russell. "We're still looking. Vesta's plains seem similar to Hawaii's surface, which is basaltic lava solidified after flowing onto the surface." As for formally reclassifying Vesta from "asteroid" to "dwarf planet", Russel says, "That's up to the International Astronomical Union, but at least on the inside, Vesta is doing all the things a planet does."